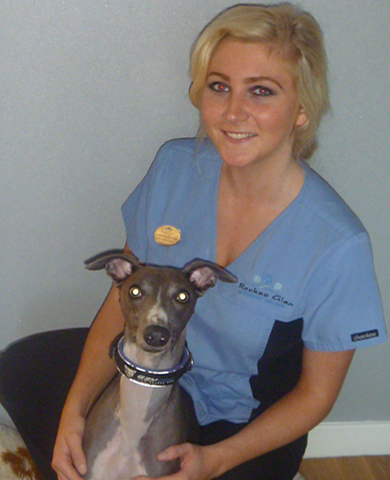 Alannah Finnie qualified as a Veterinary Care Assistant in 2011 and is currently undertaking*the Level 3 Diploma in Veterinary Nursing to become a Registered Veterinary Nurse (RVN). Here she tells us about her time in practice and how she hopes to progress in her career. I am a qualified Veterinary Care Assistant. I am currently* continuing my training to become a Registered Veterinary Nurse (RVN). Currently my job title is Student Veterinary Nurse as I am halfway through my veterinary nursing training. My role involves supporting the veterinary surgeon and RVN. Some of my daily duties include, admitting and discharging patients, monitoring anaesthesia under veterinary surgeon supervision, preparing animals for surgery, providing supportive care to inpatients, and carrying out nurse consultations, such as, post-operative checks and nail clips. I also run puppy parties. I chose a career in the veterinary industry as I knew from a young age I wanted to work with animals. Throughout my school years I completed a lot of voluntary work in rescue centres and once I got my exam results through I decided I wanted to pursue a career in the veterinary world. I am always asked why I wanted to be a veterinary nurse as opposed to a veterinary surgeon and the answer to this is I am very hands on and enjoy the nursing side of things such as supporting a sick animal. I completed the National Certificate for Veterinary Care Assistants in 2011 and I am currently* studying the Level 3 Diploma in Veterinary Nursing. The part I enjoy most about my job is nursing sick animals and helping them on their road to recovery. You build a bond with your patients and it is rewarding seeing a patient get better, knowing you have helped nurse them to this recovery. A part I enjoy least about my job is the cases where there is no treatment for an animal’s condition and euthanasia is the fairest practice for the welfare of the animal. I find these cases challenging at times as you want to be able to make the patient better but this is not possible in all cases and this can sometimes be hard to come to terms with. I plan in the next year to finish my course and qualify as a RVN. Once I have achieved this I plan to work as a veterinary nurse at the practice where I am currently employed. I hope one day to take my skills abroad and participate in a neutering clinic or work overseas for a while as I feel this would be a great learning experience. I would advise people looking to work in the industry that it is an excellent career choice although not for the faint hearted! Veterinary jobs are very enjoyable and rewarding but can be emotionally challenging at the same time. Doing some work experience in a veterinary practice would be beneficial as it will give you an insight into the sort of things you will see in practice and also the different job roles which may help you decide which one would suit you best. * Congratulations to Alannah who completed her Level 3 Diploma in Veterinary Nursing programme at the end of 2013 and is now a Registered Veterinary Nurse!